None of these stories really worried me. I mean, short of being left at the altar, most wedding whoopsies are not really that bad. Okay, yes: Annesley and Geoff were, technically, left at the altar. But let’s look on the bright side. They were not alone. They had each other. And their four siblings. 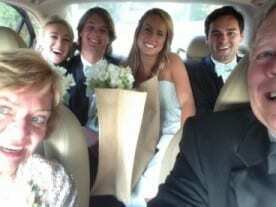 Even Robbie and I left, scampering to our car so as to beat the happy couple to the reception. And all of that was before the reception. But hey, I’m sure nobody noticed the torn wedding dress (we “fixed” it with about 18 staples and a couple of huge binder clips), the girl-fight over the bouquet (those photos are gonna be priceless), or the fact that the band didn’t come back to the stage for the second set (I found ’em watching the NBA Playoffs on the bar TV). The list goes on. And you know what? It was GREAT. And you know what else? God knew it would be. He knows what it’s like to throw a wedding – and to have things go awry. Think about it. He says that the kingdom of heaven is like a wedding where the invited guests don’t come, where they have to fill the banquet hall with street people, and where an ill-clad guest has to be ejected (Matthew 22). He knows all about receptions where they run out of wine (John 2), or fuel for the lanterns (Matthew 25). And what about the truly worst-case scenario, back in Genesis 29, when the groom wakes up the morning after and realizes he’s married the wrong gal? Now there’s a wedding surprise. Maybe it’s the old misery-and-company thing, but I started reading up on all of these Bible weddings and, truth be told, the only wedding where everything goes right is Christ’s. We can read the press coverage in Revelation 19: The onlookers are pumped (their hallelujahs sound like thunder), the bride is ready (she’s dressed in fine linen), and the whole thing just smacks of utter, limitless joy. And the best part about this wedding? The bride is us! It’s true. When we fall in love with Jesus, he gets rid of our ragged clothes. He dresses us in beautiful robes of righteousness. And he changes our name from “Deserted” and “Desolate” to one that means “My Delight” (Isaiah 62). Weddings just don’t get any better than that. As a bridegroom rejoices over his bride, so will your God rejoice in you.